As part of AT&T’s efforts to enhance our network to accommodate future growth, we will be making a firmware upgrade to your AT&T U-verse Gateway. Customers who have configured their network to use the 10.0.0.1 – 10.255.255.255 private Internet Protocol (IP) ranges within their AT&T U-verse Gateway will need to change to an alternate IP range. AT&T recommends changing to a 192.168.1.x IP range. I’ve run into a couple of people who thought that the new Verizon iPhone would use the new (and highly-promoted!) Verizon 4G LTE network. But, no. CDMA for this product, resulting in no voice and data at the same time, either… The following article suggests that users may opt for Android-based 4G devices to get the speed. Prior to Tuesday’s announcement, some had hoped the Verizon iPhone would support the carrier’s newly launched 4G LTE network. But the forthcoming Verizon iPhone will be a CDMA model capable of 3G speeds, and will not access the carrier’s 4G network. 4G LTE mobile broadband offers speeds up to 10 times faster than Verizon’s current 3G network. Real-world data rates of between 5 and 12 megabits per second downstream are expected, while upstream is expected to achieve between 2 and 5 megabits per second. At the Consumer Electronics Show last week, Verizon rival and former exclusive iPhone carrier AT&T highlighted plans for its own 4G LTE network, set to begin deployment this year. NEW YORK — Verizon Wireless and Apple Jan. 11 said they will launch a CDMA version of Apple’s iPhone 4, confirming what the mobile tech world has been speculating about since AT&T launched the iPhone in 2007. Apple COO Tim Cook acknowledged the Verizon iPhone 4 handset is similar to the AT&T iPhone 4, from the FaceTime video chat application to the crisp Retina display. The handset also sports the original iPhone 4’s LED flash, HD video recording, 5 megapixel camera and Apple’s signature glass and stainless steel design. However, Cook said Verizon iPhone 4 offers one key feature difference: access to Verizon’s Personal Hotspot WiFi node capability, which connects up to five WiFi-enabled devices. There is another big difference that may put off some more discerning consumers. Verizon’s iPhone 4 runs on CDMA technology, which does not allow simultaneous voice and data performance. The fiber-optic outage—actually sabotage—in the Bay Area on Thursday reveals a dirty little secret: Our infrastructure is ridiculously vulnerable and it only takes a few vandals (or terrorists) to bring communication to its knees. 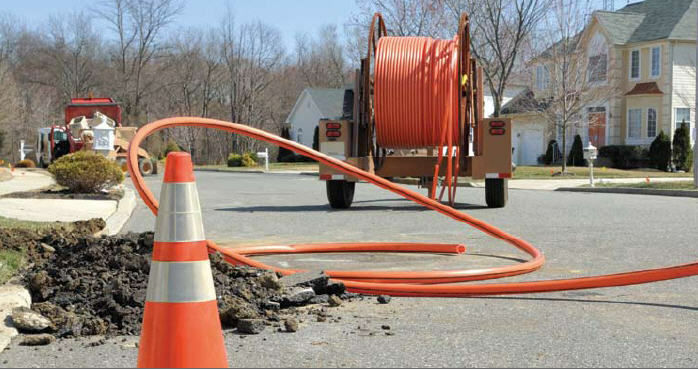 While it’s unclear what exactly happened, AT&T is offering a $100,000 now $250,000 reward to find the vandals that cut into fiber optic wires and whacked everything from hosting centers, 911 calls and other communication. Sam said it best: No matter how advanced we get we’re still hooked up to a big wire somewhere. That’s not going to change. The big question: How are we going to protect those big wires? via Jason Hiner at AT&T fiber outage shows how easily attackers could wipe out our communications | Tech Sanity Check | TechRepublic.com.